To receive news and special event information please join our mailing list click below. "This restaurant has a creative and diversified menu. Items dubbed "small courses" are very ample. Everything not only tastes good but looks appealing. The only problem is that the restaurant is small and very noisy. however they are aware of this and are taking steps to alleviate the problem". "We've been here 3 times and had a great experience each time. It's a small place on a corner near Ravinia Festival and has outdoor seating. I've had their burger - which got a great writeup in Chicago magazine - and some of their fish and meat entrees and all were good. They have some interesting craft beers at the bar and a very friendly waitstaff." went to Abigail's on a whim last night after Ravinia. Short wait, had the option of inside or outside, chose outside. Wait staff very attentive. Brought out those delicious cheese muffin things. Normally don't do dessert, but chocolate peanut butter tart with banana ice cream-loved it! coming from the city, it was nice to sit outside without bus fumes every 5 minutes. 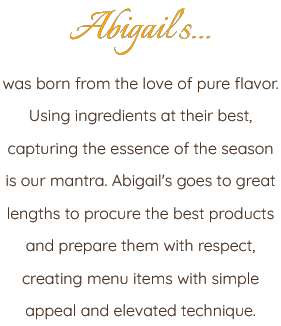 "We had a wonderful meal with friends recently at Abigail's. The space is very small and they do not take reservations so be prepared to wait. No problem for us on a cold Wednesday night...the bartender was very helpful in helpful in selecting some wines and for me at the end of a cold some nice "brewed in your own teapot" hot tea." 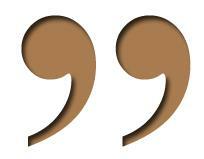 "The service was exceptional and they even asked us (free of charge) to try a new appetizer selection. It was the roasted beet salad and it was sensational. The entree's were equally as appetizing. We ranged from the burger and salmon to the flat iron steak and pork loin. Can sum it up in one word Yummy!" "The menu is small but quite innovative... food was delicious, our waiter was quite knowledgable and witty, decor... urban/hip... a nice change for Highland Park. Their signature drinks were fab. The only downside was the noise. Once the restaurant was full, it was quite difficult to have a normal conversation. I hope they can remedy that, or we'll have to opt for outdoor seating... if they ever have any!" "Week night, nice crowd but not crowded. Decor elegant, harmonious, very comfortable. Service spot on, attentive and friendly. Dishes are perfectly executed variations on some classics. Flat iron steak (instead of filet) with frites & hericot vert was excellent. Short rib was melt in mouth - combination of sweet potato gnocci, apple and pistachios worked wonderfully.Veg soup and beet salad excellent. No room for dessert - next time ! Good Value." "Lovely intimate restaurant with surprisingly fresh and interesting menu. Pretty decor, nice service, wonderful food. Would definitely go back." "Finally a top choice in Highland Park. The small space (with added tables for Summer) and a no reservations policy makes it difficult to find a place to enjoy terrific food, beautifully prepared and served." "Excellent meal. it's great to have a very good,reasonably priced place in highland park"
"Tried it out a couple of weeks back, small, but had the right 'vibe'. Hostess was pleasant, bartender actually was the highlight. We opted to eat at the bar as the dining room was quite loud. Decided to try basic fare, and see how well they did with that. Buffalo Shrimp were delicious, perfectly cooked and spiced. Burger was perfection as well as the frites. Rosemary chicken, was a bit underccoked (yuck) and void of real flavor. Dessert was great, excellent coffee and a superb wine & beer selection. Will go back..and sit at the bar." "Stopped by for dinner after an early movie in Highland Park. My wife and I shared and totally enjoyed all. The Flat Bread Pizza was terrific - who knew that beets & arugula could be outstanding on a pizza? I can't say enough about the Duck Confit - I woke up thinking about how great is really was! Save room for desert - Apple tart was a great ending to a memorable dinner. I will return & often!"